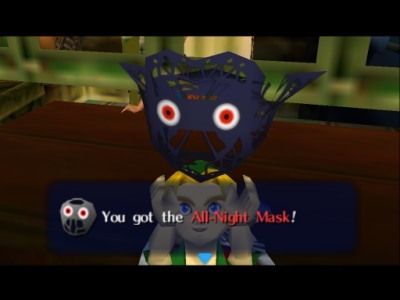 In the Majora’s Mask you can use this mask to stay awake, when you listen to the stories of Anju's Grandmother. Which can earn you 2 Pieces of Heart, one for hearing out the story and answering the question correctly, the other is gained by listening to the other story and answering “I dunno”. The All-Night Mask can be obtained by saving the old ladies’ bag in North Clock Town the first night from Sakon the thief, then wait until the third night and enter the Curiosity Shop. Since Sakon couldn’t deliver the stolen bomb bag, it is replaced with the All-Night Mask. You can only buy it for 500 rupees though, so you will need both wallet upgrades to hold that kind of money. One of the Gossip Stones on the Moon tells you that the All-Night Mask was used as a torture device of insomnia. That would make quite a psychological torture indeed, just take a look at Link’s face... But than again it would work better than any kind of coffee if you’re trying to stay awake. instructions will put you to sleep? The Japanese name translates roughly to "Staying-up-late face." In French this mask is called: "Mask of Sleepless night", which does roughly translate to the purpose of this item. In German is is known as the " Mask of the Night". In Spanish this mask's name is "Mask to stay up late". This is somewhat different, but not too much. This page was last modified on 1 February 2006, at 21:19.